What is it like to be a scholar at Kids On Point? 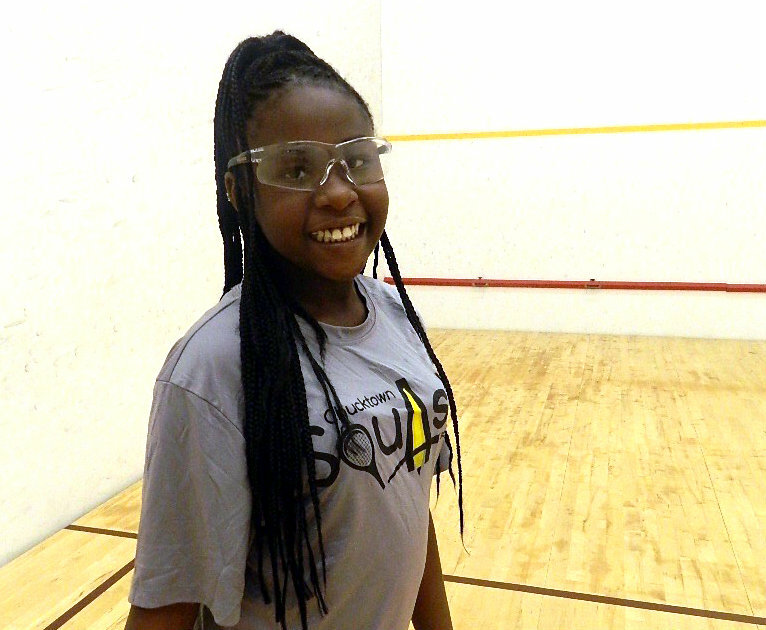 People who aren’t familiar with urban squash programs may be surprised at just how busy Kids On Point scholars are every day after school. 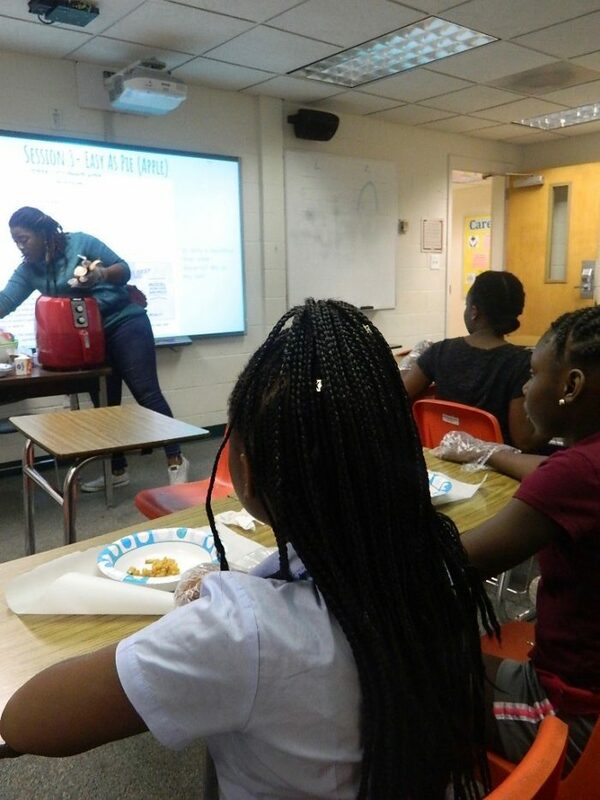 Afternoons at Kids On Point pack in athletic, academic, and enrichment programming, along with mentorship and a small meal and snack. Follow along with one of our scholars, Ja’Aunna, in a day in her life at Kids On Point. Ja’Aunna arrives at the College of Charleston, where Kids On Point is located. 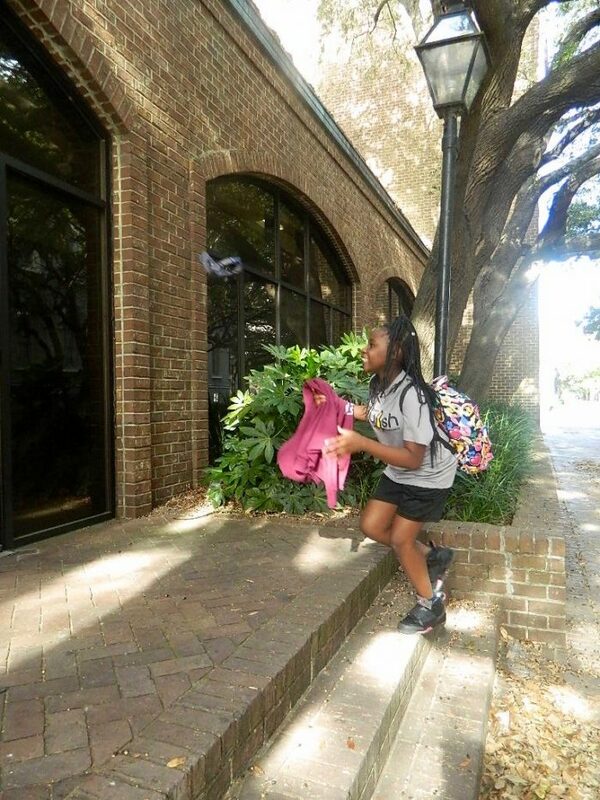 Ja’Aunna, like most KOP scholars, rides the Kids On Point bus from one side of downtown, where many of our partner schools are located, to the College of Charleston campus a few miles away. Ja’Aunna is greeted at the door by KOP staff and mentors. She makes sure she has her practice uniform on so that she is prepared for squash practice later. After-school programming officially begins with a Team Meeting on the squash court. All 45 scholars meet on the center squash court for daily announcements. Today, Ja’Aunna’s small group (called a Crew) is starting the afternoon with homework time, while the older Crews start the afternoon with squash practice. When Team Meeting ends, Ja’Aunna and her Crew grab their backpacks and walk with their mentors to the classrooms in the adjoining building. After having a healthy after-school meal of a turkey wrap, fresh veggies, and fruit, Ja’Aunna gets started on her homework. Today, she has math and reading homework. Jazmine, the Lead Mentor for Ja’Aunna’s Crew, sits down with her to check in about the assignments that need to be completed for the week. 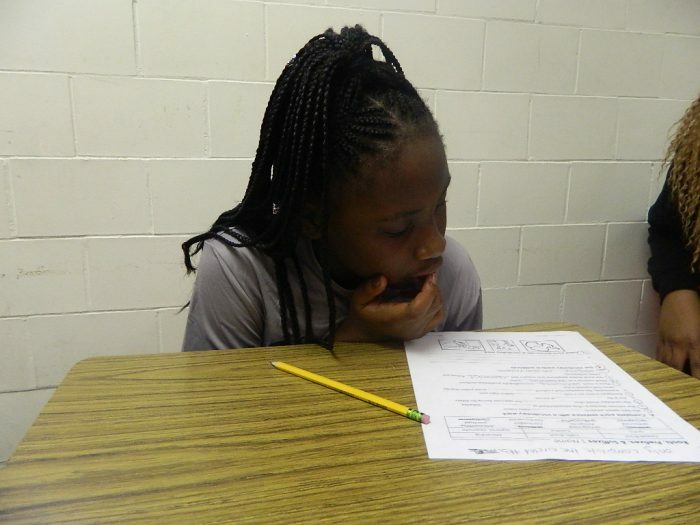 Ja’Aunna gets to work on her assignments and asks one of the mentors for help when she gets stuck on a question. Pretty soon, her homework for the evening is complete! With her homework finished, Ja’Aunna and her Crew leave the classrooms to go to squash practice. 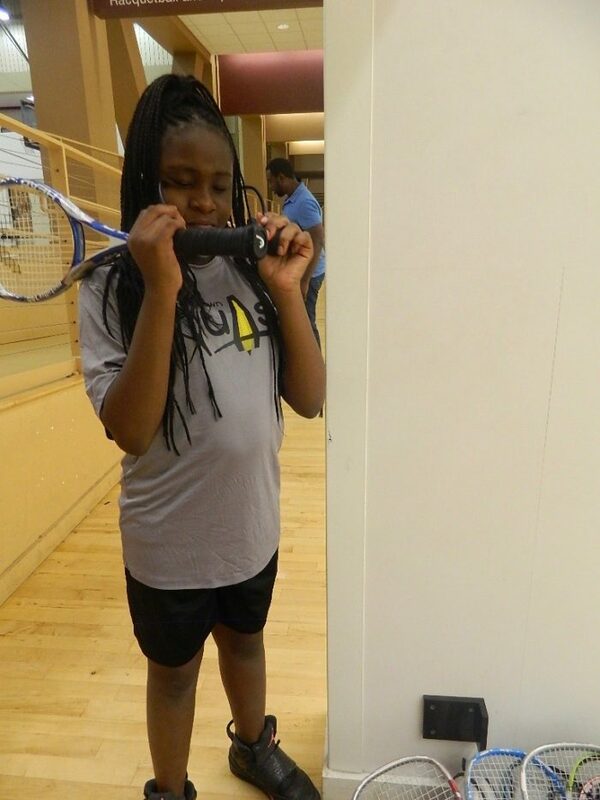 Ja’Aunna puts her squash gear on. Coach splits the group between 3 squash courts and mentors lead the warm-up drills on each court. For the last 20 minutes of squash practice today, Ja’Aunna’s Crew is going to play practice matches against one another. Ja’Aunna practices some of her hits before taking on one of her teammates. 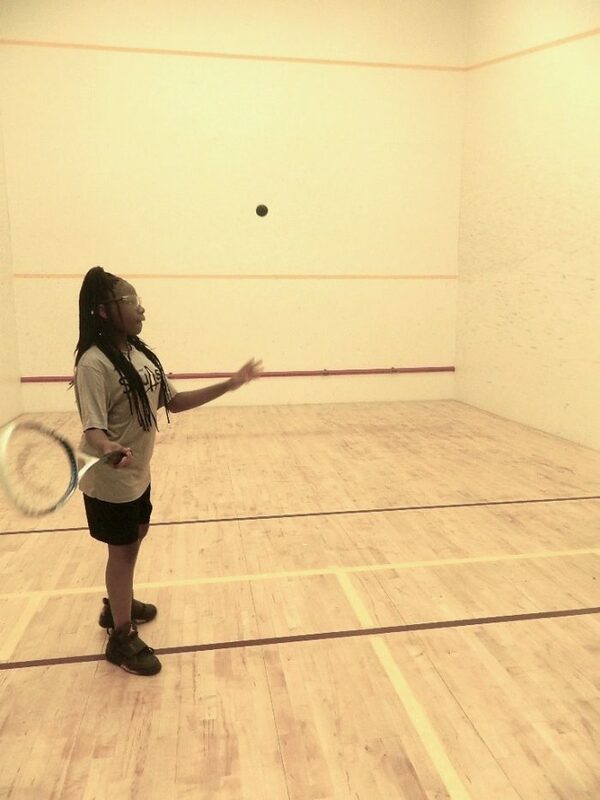 Squash practice is over, so Ja’Aunna’s Crew heads to their last activity of the day: enrichment club. Enrichment clubs change every quarter so that scholars can be exposed to a variety of new ideas and activities. Ja’Aunna is taking Cooking Club this quarter. 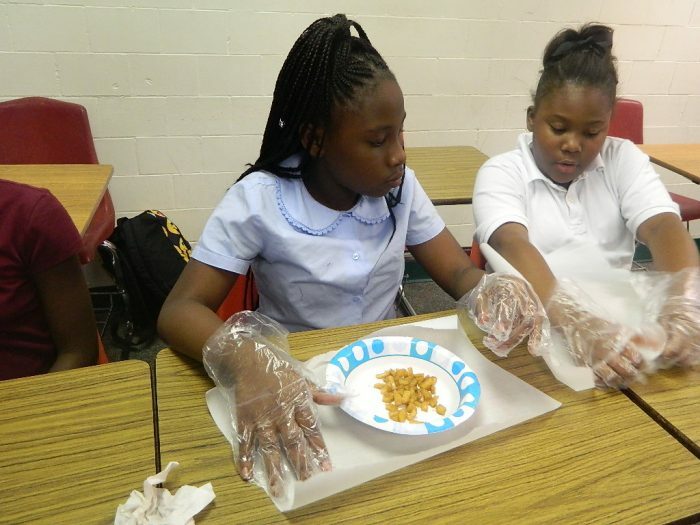 In Cooking Club, the scholars learn how to make recipes with ingredients that are commonly found at home. Today, they’re making apple pie roll-ups. The finished apple pie roll-ups were so delicious that they were all eaten before a picture could be taken! When Cooking Club ends and everything is cleaned up, it is time to head back to the squash courts for the end-of-the-day Team Meeting. All of the scholars, mentors, and staff meet on the courts again to hear final announcements and to do shout-outs. Scholars are encouraged to give shout-outs to a person who they want to thank or someone they saw do something positive throughout programming. 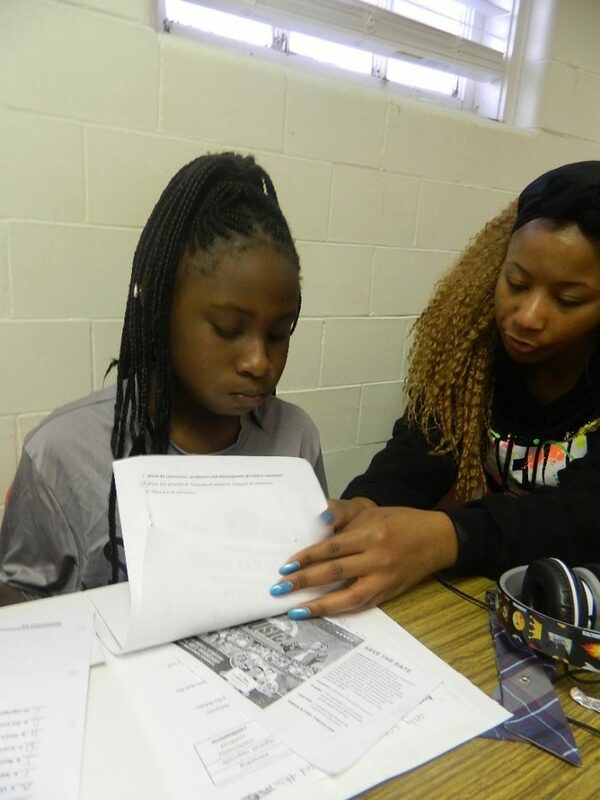 Ja’Aunna gives a shout-out to one of the mentors for helping her with her homework. After Team Meeting, it’s time to go home! Every day at Kids On Point is a little different, but one thing is the same: our scholars work hard and are pushed to succeed every day! Want to learn more about our organization and the work we do with under-served students? Email info@kidsonpoint.org.